This car was originally built in 1995 no expense spared best possible build to take to the runoffs in 1996 where it qualified on the front row and led the first 15 laps in a 45 car field. It has since been updated to all current AS specs. .030 Boss 4 bolt block, Edlebrock heads, Jesel shaft mount rockers, Callies crankshaft, Mahle pistons, Crower I beam rods, 8,000 rpm rev limit. This car has so much performance potential SCCA just raised the minimum weight by 100 pounds! I see the 2014 runnoffs flag in your photo. Did you or this car win? If so I would mention it in the add? Dylan Olsen won in this car in 2014. Scott, Dylan's dad led all those laps in this car during the 1996 run-offs. 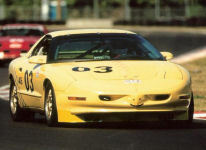 This car was also driven at Mid-Ohio runoffs for many years by Chris Billings. I think Chris' best finish was a third or fourth, maybe in 2004? All these guys are pretty decent drivers :-), and this is a fast car. $24,000 The car needs a new exhaust system, the one that's on it is just too old and rusty. Will adjust price accordingly.